Hair reduction, pigmentation, ‘age’ spots, freckles, sun damaged skin, capillaries, excessive redness, rosacea, fine lines, open pores, and to improve skin texture and increase collagen growth. Our photo-facial is a skin treatment harnessing the power of IPL light to improve skin health and complexion. We use the market-leading Ellipse IPL system and have many happy patients. A course of our IPL photo-facials can address many of these concerns and is especially great for clearing pigmentation, rosacea/ redness, fine capillaries, and assist with firming. Targeted pigment may turn darker and slough off over the following 14 days, and capillaries may darken or blanch on the spot. Depending on your skin type and concerns you may be advised to have 3 -6 treatments at monthly intervals. The IPL pulse into the skin has been described to feel like a flick of a rubber band. There is minimal downtime; pigment spots will need to darken and fall off naturally, and redness from vessels will gradually fade. Some patients may have mild redness immediately after the treatment but can apply mineral make up, allowing them to return to normal activities immediately. IPL photo-facials are a fantastic solution for anyone wishing to reduce redness or pigment in the skin for a clearer, brighter complexion. IPL can effectively treat facial veins. These treatments can also be performed on the neck and chest to improve the appearance of the decolletage, or the arms and legs to reduce pigment. Please click here for more information on IPL treatment for vascular and pigment concerns. Whether you want to correct uneven skin tone, sun damage, pigmentation, redness or target the signs of ageing, our IPL photo-facial might be right for you. This is a non-ablative, minimally invasive option to give you a clearer, fresher complexion. What is an IPL photo-facial and how does it work? Our IPL photo-facial is an advanced skin treatment using IPL light to improve the appearance of the skin. Your skin will be assessed and cleansed before the treatment starts. Then, a conductive gel is placed on the skin and the IPL pulsed on top of it. The light will absorb into specific 'structures' in the skin, for example excess pigmentation or redness. These target structures are then modified so that a gradual clearance is achieved. The outcome is a clearer complexion with less pigment and redness. We consider our IPL photo-facials to be 'colour corrective' treatments. 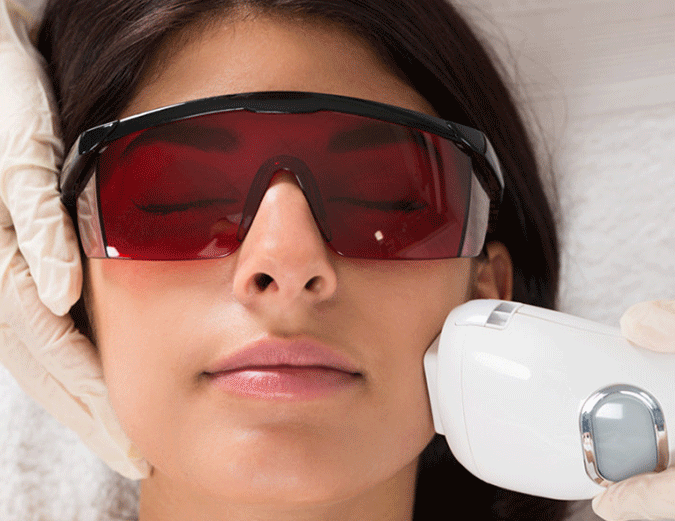 What can an IPL photo-facial treat? IPL photo-facials treat many forms of pigmentation including freckles, sun spots, age spots and some birthmarks, and can successfully treat excessive facial redness/ rosacea and facial capillaries. Although not a first-line treatment, some acne pimples will dry out and start to fade after a photo-facial as well. Each time you have an IPL photo-facial you will see improvements in your skin. Generally a course of 3 - 6 sessions may be recommended at monthly intervals. The number of treatments you require will depend on your skin type and what you are trying to achieve. Our Ellipse IPL gives almost no downtime. Some patients may have mild redness immediately following the treatment, this usually fades within the day. Pigmentation may start to darken and continue to do so over the day. Then it will be noticeably darker and form a micro-crust. This micro-crust will naturally fall off over 7- 10 days to reveal more even pigment. You are able to return to normal activities immediately after an IPL photo-facial, and we can also apply mineral make up.